Karen Shannahan, 18 and Gay Henry, 18. In neg with photog in foreground, he is Peter Gowland. 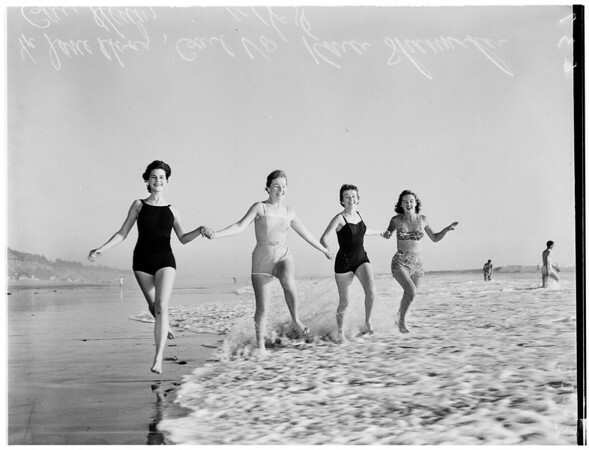 D36: Pjotographer [sic] Peter Gowland takes advantage of summer weather to snap bathing girls at Will Rogers State beach. Girl istting is Gay Henry, 18. Standing, l-r are Gail Vos, 19, and Karen Shannahan, 18".